In October 2015, we launched our latest game, Picture Pile. The idea is simple: look at a pair of satellite images from different years and tell us if you can see any evidence of deforestation. Thanks to the participation of many volunteers, 2.69 million pictures have already been sorted in our pile of 5 million pairs. But we still have a long way to go, and we need your help to get us there! Deforestation is one of the most serious environmental problems in the world today. Forests cover a third of the land area on Earth, producing vital oxygen, habitats for a diversity of wildlife, and important ecosystem services. 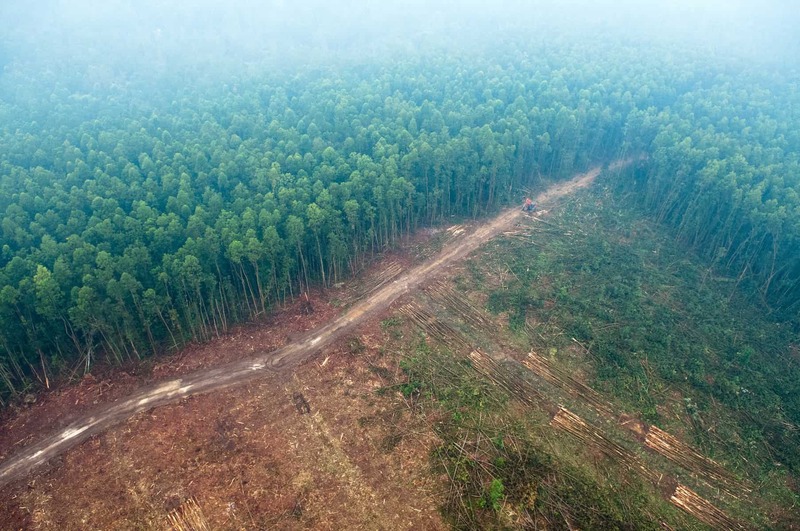 According to the World Wildlife Fund (WWF), some 46,000 to 58,000 square miles of forest are lost each year, which is equivalent to 48 football fields every minute. But this is a rough estimate since deforestation is very difficult to track. Reasons why are that satellite imagery can be of insufficient spatial resolution to map deforestation accurately, deforestation mostly occurs in small chunks that may not be visible from medium-resolution imagery, and very high-resolution data sets are expensive and can require big data processing capabilities, so can only be used for limited areas. To help contribute to better mapping of deforestation, researchers in IIASA’s Earth Observation Systems (EOS) group, led by Steffen Fritz, have been working on novel projects to engage citizens in scientific data collection that can complement satellite-based traditional deforestation monitoring. One of the latest applications is Picture Pile, a game that makes use of very high-resolution satellite images spanning the last decade. Designed by Tobias Sturn, the aim is to provide data that can help researchers build a better map of deforestation. 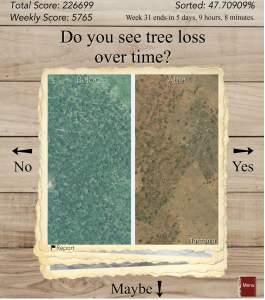 Players are provided with a pair of images that span two time periods and are then asked to answer a simple question: “Do you see tree loss over time?” After examining the image, the player drags the images to the right for “yes,” left for “no,” or down to indicate “maybe” when the deforestation is not clearly visible. Every image is sorted multiple times by numerous independent players, in order to build confidence in the results, and also to gain an understanding of how good the players are at recognizing visible patterns of deforestation. Once enough data are collected at a single location, the images are taken out of the game and new ones are added, thereby increasing the spatial coverage of our mapped area over time. Right now we are focusing on Tanzania and Indonesia, two regions where we know there are problems with existing maps of deforestation. Picture Pile is focusing first on Indonesia (pictured) and Tanzania – two regions where there are problems with existing maps of deforestation. Photo (cc) Aulia Erlangga for Center for International Forestry Research (CIFOR). Once the pile is fully sorted, the 5 million photos in the data set will be used to develop better maps of forest cover and forest loss using hybrid techniques developed by the group as well as inputs to classification algorithms. We will also use the data to validate the accuracy of existing global land cover maps. Finally, we will mine the data set to look for patterns regarding quality (for example, how many samples do we need to provide to the “crowd” before we can be confident enough to use their data in further research). In short, by integrating citizens in scientific research, Picture Pile will also help us improve the science of land cover monitoring through crowdsourcing mechanisms. So please join in and help us get to the finish line. You can play Picture Pile in your browser or you can download the free iOS/Android app from the Apple and Google Play stores and play on your smartphone or tablet. Your contributions will help scientists like those at IIASA to tackle global problems such as deforestation and environmental degradation. At the same time you may win some great prizes: a brand new smartphone, a tablet, or a mini tablet. Land cover is of fundamental importance for environmental research. It serves as critical baseline information for many large-scale models, for example in developing future scenarios of land use and climate change. However, current land cover products are not accurate enough for many applications and to improve them we need better and more accessible validation data. We recently argued this point in a Nature correspondence, and here we take the opportunity to expand on our brief letter. 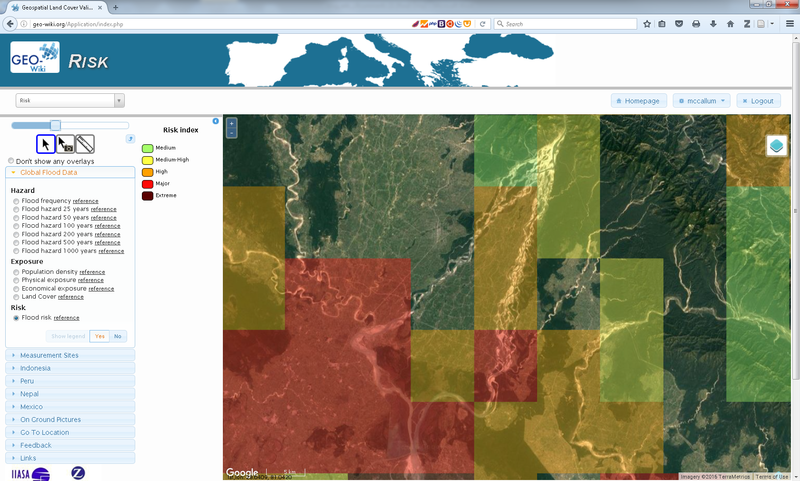 In the last decade, multiple global land cover data products have been developed. But when these products are compared, there are significant amounts of spatial disagreement across land cover types. Where one map shows cropland, another might show forest domains. These discrepancies persist even when you take differences in the legend definitions into account. The reasons for this disagreement include the use of different satellite sensors, different classification methodologies, and the lack of sufficient data from the ground, which are needed to train, calibrate, and validate land cover maps. A recent Comment in Nature (Nature, 513, 30-31; 2014) argued that freely available satellite imagery will improve science and environmental-monitoring products. Although we fully agree that greater open access and sharing of satellite imagery is urgently needed, we believe that this plea neglects a crucial component of land cover generation: the data required to calibrate and validate these products. At present, remotely sensed global land cover is not accurate enough for monitoring biodiversity loss and ecosystem dynamics or for many of the other applications for which baseline land cover and change over time are critical inputs. When Sentinel-2–a new Earth observation satellite to be launched in 2015 by the European Space Agency–comes online, it will be possible to produce land cover maps at a resolution of 10 meters. Although this has incredible potential for society as a whole, these products will only be useful if they represent the land cover more accurately than the current products available. To improve accuracy, more calibration and validation data are required. Although more investment is clearly needed in ground-based measurements, there are other, complementary solutions to this problem. Not only should governments and research institutes be urged to share imagery, they should also share their calibration and validation data. Some efforts have been made by the Global Observation for Forest Cover and Land Dynamics (GOFC-GOLD) in this direction, but there is an incredible amount of data that remains locked within institutes and agencies. The atmospheric community shares their data much more readily than the Earth Observation (EO) community, even though we would only benefit by doing so. Crowdsourcing of calibration and validation data also has real potential for vastly increasing the amount of data available to improve classification algorithms and the accuracy of land cover products. 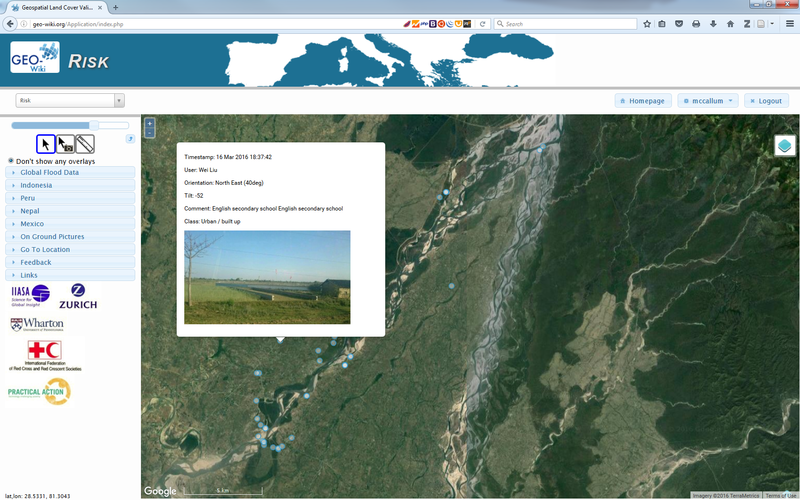 The IIASA Geo-Wiki project is one example of a growing community of crowdsourcing applications that aim to improve the mapping of the Earth’s surface. 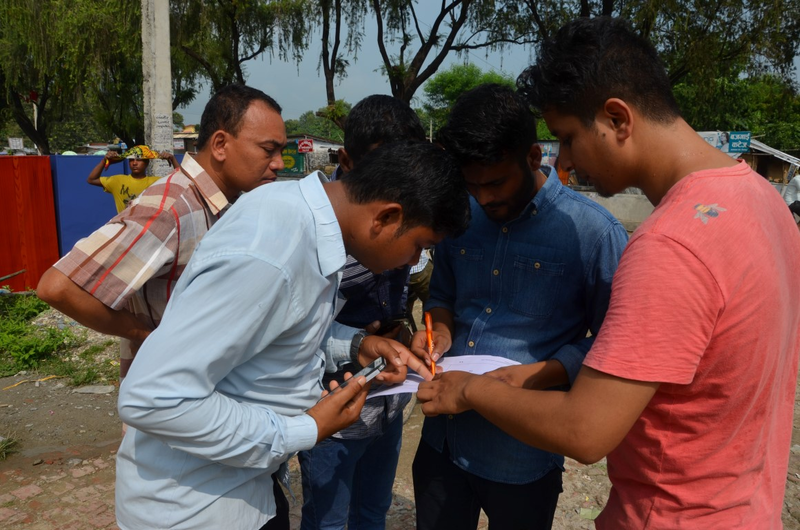 New apps developed by IIASA’s Earth Observation Team aim to involve people around the world in on-the-ground data validation efforts. Geo-Wiki is a platform which provides citizens with the means to engage in environmental monitoring of the earth by providing feedback on existing spatial information overlaid on satellite imagery or by contributing entirely new data. Data can be input via the traditional desktop platform or mobile devices, with campaigns and games used to incentivize input. Resulting data are available without restriction. Another major research projects we are using to address many of these issues identified above is the ERC Project Crowdland .